A Louisiana Waterthrush was found & photographed Tuesday in Central Park, around mid-day. A very actively-feeding new arrival, the warbler was in a good place for quiet & peaceful feeding, undisturbed by any human activities (including any unnecessary over-playing of audio at birds already in full view). 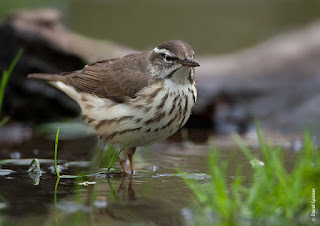 This may've been a first-of-year waterthrush in the park, even though a modest flight of the species already occurred some days prior, including into some sites well north of the N.Y. City area. At the same area & time as the waterthrush sighting were a (red) Fox Sparrow, a Ruby-crowned Kinglet, an E. Phoebe, and several Hermit Thrush, as well as much more common migrants or wintered-over visitors. One of the multiple Red-tailed Hawks of the park's perimeter areas also made a visit to the area. Obviously more waterthrushes & all the other typical April-arrivals are hoped-for when the weather allows. Earlier Tuesday, some Great Egrets were flying over the n. end of the park in the typical east & west flight-trajectory as seen in that part of the park from this month to end of summer. The n. end also featured a goodly batch of Blue-gray Gnatcatchers as it has for a few days now, & other migrants which have been noted in recent days, all in small or modest numbers. Belted Kingfisher has continued to be seen in the last week esp. from the park's north end, but also elsewhere at times. Palm Warbler was again present at least in the n. end (with many more due in, any day.) Tree Swallows started to reappear IN the park (besides high fly-overs which are typical in early spring) and a few N. Rough-winged Swallows have been occasional at most recently, the Meer. A report surfaced of a Barn Swallow from the Meer as well, which is quite possible now. At the reservoir, it seemed that some, perhaps many, ducks & some of the other birds had moved, or even departed, although Pied-billed Grebe was one that remained. N. Shovelers were also still there but in reduced numbers to a week or more ago. One Hooded Merganser has been lingering & Buffleheads also are, as well as fewer & fewer Ruddy Ducks, of which some are in near-full breeding attire in recent days. One male Wood Duck also has been in the same general area as previously-recently. On a pass thru the Ramble, I helped to clean up bits of wire & other debris from the fencing that's being removed from a winter-work-site in the central Ramble - while the contractors did a lunch-break - so as to keep tourists & other visitors from tripping & getting hurt in what's become yet another section of the park that is busy as can be with visitors of all sorts. There was water from recent rain in the area of the Ramble often called the "swamp" in the s.w. portion of the Ramble; a number of plants are now planted growing there appropriate to wetter conditions... with luck, it may be a good place to look for some species with swamp-ish affinities in the migration period. Near there, at the Azalea Pond, a breeding-plumaged Rusty Blackbird was skulking about with a more typical-of-species wariness. A gentle reminder to all including myself of the core principles in basic birding ethics (applies anywhere in the world, even as formulated & expressed by the American Birding Association, revised versions) - see in particular Article 1, all aspects determining how one may act most ethically while observing birds. In addition, please see Article 4, items a. through g. - and with attention to 4.b. - with respect to observed unethical behavior by anyone actively leading a group or walk: attempt to document, and make that documentation available to local & regional birding clubs, societies, organizations, and in the case of repeat-offender situations, to the authorities for the land or park in which the activity is observed, as well as to enforcement, including if & as necessary, report to law-officers, if that should seem the only recourse with a multi-repeat & un-repentant "serial" offender. A clear first recourse is politely asking that obvious-observed-unethical activity be terminated, and that it not be repeated.